The Royal Mail has been scuppering my enjoyment of tea recently by refusing to deliver anything I had ordered. Some how everything else was arriving except my tea, perhaps there is a pu erh sipping postie in Warwick? Finally though something did creep through and I'm excited about it. This was the first of my various 7452's to arrive and being from 1999, somewhat older than a lot of teas I usually drink. What a fantastic tea.. It has plenty of maturity and depth but still such sweetness comes out of nowhere.. I have been troubled with the amount of bottled water I have been going through. One positive is that I'm recycling them all and by taking them out of work at least I'm getting those bottles back into the system. It still troubles me though to see so much plastic. My solution is to switch to bamboo charcoal filtering. No plastic waste, road miles in delivery, cheaper and ecologically sound as well, consider it. I ordered this tea from the popular China based Ebay shop, Dragon Teahouse. They ship quickly and are generally cost effective compared to western shops. Their 大红袍 da hong pao or Big Red Robe selection is priced and sold in 100g and 500g offerings at different quality levels much like their other teas. You can get 100grams for either about £10 or £18 depending on the grade. Something caught my eye though. They also sell a branded da hong pao by a company called Wuyi Star that is, rather oddly, packaged in what looks like a packet of cigarettes! This tea costs a whopping £8 per advertised 18 grams (postage included) and it turns out that they are in fact only 16 gram boxes with two 8 gram foil sachets inside. This struck me as rather costly but an interesting purchase. I have some average da hong pao as well as some good stuff, how would this 'top grade' compare? I warmed my yancha pot, emptied it and then poured the leaf inside. The warm clay heated and lightly steamed the leaves giving me a chance to catch a most wonderful aroma of chocolate transforming to dark brambles. This is good and I haven't even brewed it yet. I decided to not rinse but fill the pot so the froth is displaced as I close the lid. A short 15 second infusion and the dark tea is poured into my glass jug. I just miss my chance to smell the pot after pouring so I go on to drink the tea. The flavours don't overpower me but I can't say it's bland, it's more like the dark cocoa hints are there to be discovered and I am surprised to have an almost instant huigan and some energetic feelings around the sides of my tongue. Round two! The pot smells very aromatic before I add the water but somehow isn't very powerful after the infusion. I poke my nose further into the pot to pick up the interesting aromas on display, I catch a couple including grapefruit and a very hot steamed conk. The thick and potent soup tastes a little dark and a bit bitter, I'll back off the heat of the water next time around. There are hints of those dark bramble fruits underneath. It's not quite what I was expecting but I'm enjoying the session. Boil the water, wait for it to cool a little, in it goes, count to ten and pour... I'm about to drink when the sweet caramel aroma of the soup distracts me then I notice how much I am feeling the tea in my head. 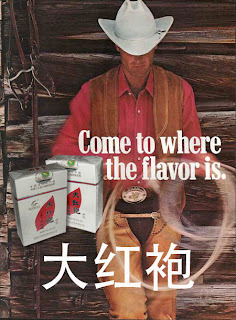 I'm going through infusions of this tea fast... slow down cowboy! What should I conclude about this tea? The smell of the dry leaf in the warm pot was fantastic as was the aroma of the soup. The aroma of the emptied pot didn't have that interesting transition but the tea itself was potent and like a dark chocolate, hints of fruit tones with a sweet smelling soup. It's gone right to my head too! If I compare it to Jing Tea UK's premium da hong pao I believe that it only surpassed that tea in it's aroma but the taste was just a little too dark cocoa for my liking. Somehow I'm left a little short of my expectation. You can't get a lot for a quid nowadays! But here is an example. Jing Tea offer 10grams of this tea for just a pound so I thought 'What the heck!' and stuck it on the end of my order. ... what if pound shops sold pu erh? The dry leaf smell is very Benson and Hedges and also very twiggy. It kind of reminds me of a rack of lamb in shape. Hmm, it's so dark. The dry leaf goes into the warm empty pot and the heat alone arouses the aroma, again it's tobacco. First infusion is on the brink of amber, the soup is sweet and lightly tobacco. Not much else. I drink it quite quickly hoping to get onto the next infusion. Second infusion and the leaves are open now. I'm quite surprised that many of them are an unusual dark olive. I was somehow expecting them to be more brown, not because it's an old bing but that the soup is darker than I expected. I did get a hit of green in the aroma revealing that it's youth hadn't quite escaped it yet. Third infusion and the sweetness is leaving but it leaves a void behind as nothing takes it's place. I experience a short huigan. It's at this point that I decide to have a test and quickly brew an equal proportion of my 2007 Bulang Spring Tips, a tea that really doesn't excite me and give them both an AB test (it is at this point I really notice the Bulang bing being layered with lots of tips on the outside and on the surface only). There's not a lot of difference between them really and there the pu erh session ends and a mug of Margaret's Hope darjeeling waits. Well, it was just a pound in the end I would have to say it was a learning experience. I would recommend anyone ordering from Jing Tea London to spend an extra quid for this sample, it's such a cheap way to have a little look at pu erh. What I wouldn't recommend is that anyone spent £34.60 on a bing like this, it just didn't stand above a very average pu erh that costs just $12 or so. I am suspicious of youngish sheng producing orange soups, to me it suggests tweaking. At least yesterday was good. I am going to enjoy today, I have something I think will be special. Despite the postal strike's best effort to stop all my tea from arriving I did receive a sample from Jing Tea London within 24 hours of ordering, well done Jing! As a side note I am becoming quite impressed by them as a company, their service has been very good. I even got a phone call apologising for one of my glass tea cups having a defect. They seem to be a good bunch. They only stock a handful of pu erhs, it's not really their thing but if a company like Jing decides to choose just a couple of pu erhs to represent them, you would imagine they are going to pick a good one. Of the two bings they sell, one is from 2007 and the other 2003. The latter I shall deal with here. One thing it's not is cheap, priced at a whopping £132.40 per bing! Despite this high price the sample pricing is very fair. 350g using the sample price is £131.25! Now, I'm not sure £132.40 is a good price for this tea, it seems rather high. But I haven't been able to find it sold online elsewhere to compare the price. Anyway, £3.75 isn't a lot to spend if you think about it. I'll get two sessions from the 10g sample and, if it's got good legs, an awful lot of infusions from each session. The final cost of each infusion is pennies. 5g rinsed then brewed with One Love Welsh spring water in my yixing pot. The first infusion is sweet, slight tobacco and some camphor in the finish that awakes the tongue and leaves my mouth feeling cool. Second infusion reminds me of honey, amber and thick, the camphor has picked up and the center of my tongue feels more energetic. The tobacoo is more pronounced and I am able to observe the woodiness. My lips feel a little numb, especially my lower lip and I feel more focussed. Just before I am about to start my third infusion I notice my tongue is still alive with feelings from the last steep. The soup is slightly darker now and this is when it's at it's best. My session is cut short by the need to pick Michelle up from college (note to self : allow much more than an hour for a good session). On the drive over to Stratford I pick up a nice huigan, not overpowering but pleasant. I also pick up a £60 speeding ticket and three points which shatters my mood somewhat. Subsequent infusions are lasting but don't have the magic of the first three, perhaps my mind is elsewhere now? It's a very nice pu erh. I don't think it's £132 nice but still highly enjoyable and it sets the benchmark from now on for me. I'm gonna wrap up this session's notes with a very pleasant huigan in my mouth. It's quite usual to have a free sample thrown into a shipment of tea and the last time I ordered from Pu erh Shop I had some Yunnan premium silver thread amongst my things. 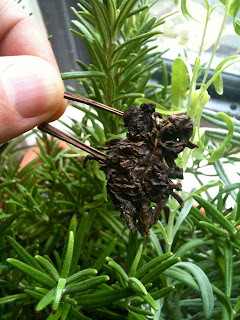 It's decided inexpensive at under $4 per 50g and it is described as a 'green' tea but it is most unusual. Quite often with pu erh I have used the word 'beanie' to approximate the smell of freshly boiled legumes. As an odour it is very strong in my 09 pu erh teas and not so in teas slightly older. I have associated this smell with a certain flavour as well which I am really starting to dislike! Unfortunately the silver thread tea this taste and smell in droves. There is no doubt that the effects of the tea is significant, it quickly numbed my tongue and mouth, I had a strong huigan and I felt lots of sensations rising to my head. Something about this taste though, in such abundance, makes me nauseous, it's quite unpleasant. In short, I will be avoiding this tea at all costs. The knock on effect of this is effecting my drinking of young sheng pu erh as well. Patience is a virtue and I am eagerly awaiting my shipment of 7542's that are on the way. I feel that I need to branch out in my tasting of pu erh, I'm getting too stuck drinking young sheng. 岩茶 suddenly seems all the more appealing. I'm many things.. too many to list and all too many too fleeting.